The picquet was mostly used in the military as a way to maintain discipline throughout the army. 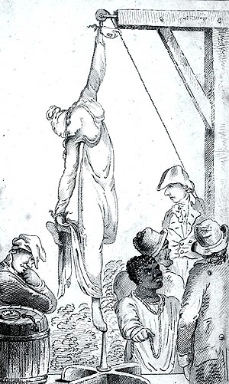 The picquet didn't require any sophisticated tools as all that was needed was placing a stake in the ground and tying the victim's thumb far above his head. The stake was never sharp enough to draw blood, but it was meant to be very painful. Sometimes, the victim's whole hand was tied instead of just his thumb to prevent major injuries. When the victim felt that his thumb was about to dislocate, he would put his weight on the stake. On the other hand, placing too much weight on the stake would lead to much pain. Although this torture method was never meant to end in death, some draconian commanders ordered their victims to be subject to this torture for up to two days - sometimes incurring death. Most of the time, this torture method only lasted a few hours, but could be carried on indefinitely. A common consequence of being subject to this torture was a broken thumb, although most often than not the victim experienced no permanent damage. This method became less popular with the introduction of the guillotine and other more visually-striking torture methods during the Late Middle Ages.